7th Rangers: Remember the Pasir Salak incident where British Resident was killed whilst bathing....the murderers who were involved were slave traders! Remember the Pasir Salak incident where British Resident was killed whilst bathing....the murderers who were involved were slave traders! Birch was killed on 2 November 1875 by followers of a local Malay chief, Dato Maharajalela, including Sepuntum, who speared him to death while he was in the bath-house of his boat, SS Dragon, moored on the Perak river-bank below the Maharajela's house, in Pasir Salak, near today's Teluk Intan (Teluk Anson). Richard O. Winstead in his "A History of Malaya" on page 226 published in the Journal of the Malaysian Branch of the Royal Asiatic Society, reprinted in 1986, wrote that a Malay deputation entreated with Governor-General Andrew Clarke in Singapore "to prevent the Resident from interfering with religion and custom, from acting without consulting Sultan and chiefs, and from depriving them of their property, namely fugitive slaves and feudal dues." Clarke had already observed on 25 March 1875 that, "I am very much annoyed with Birch and the heads-over-heels way in which he does things; he and I will come to sorrow yet, if he does not mind." On 21 July 1875 Raja Abdullah, in despair, called a meeting of chiefs where after a talk of poisoning Birch accepted the Maharajalela's offer to stab Birch to death. From the chapter 'James Wheeker Woodford Birch' in 'Malay Sketches' by Frank Swettenham (London: John Lane , 1895) It was the Malay fasting-month, the bulan puasa (fasting month) when these last events occurred. 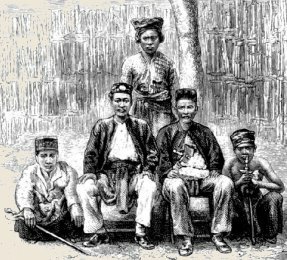 It is not an auspicious time for conducting negotiations with Malays, they do not even at-tempt to work for that month, they sleep for most of the day and sit up most of the night, eating and talking, discussing affairs and hatching plots. This, at least, is the case with the upper classes, and it is they only who are concerned in politi- cal movements; the common people do not fast as a rule, and leave the plotting to the chiefs, whose business they think it is to scheme and to direct, theirs to obey. In Lower Perak during this particular month of Ramdhan, an unusual amount of discussion had been carried on between Sultan Abdullah and his chiefs, and they determined not only that the British Resident should be got rid of, but one of them, entitled the Maharaja Lela, undertook to do the business the next time Mr. Birch visited him. During the month, Sultan Abdullah, who was then with his boats at Pasir Panjang, a couple of miles below the Maharaja Lela's house, summoned his chiefs and informed them that he had given over the government of the country to Mr. Birch. This announcement was received in silence by the others, to whom it was doubtless no news, but the Maharaja Lela said, `Even if your Highness has done so, I do not care at all. I will never acknowledge the authority of Mr. Birch or the white men. I have received letters from Sultan Ismail, the Mentri and the Panglima Kinta telling me on no account to obey the English Government in Perak. I will not allow Mr. Birch to set his foot in my kampong at Pasir Salak.' The Sultan said, `Do you really mean that, Maharaja Lela?' and the Chief replied, `Truly I will not depart in the smallest degree from the old arrangement.' Another chief, the Datoh Sagor, who lived on the other side of the river, exactly opposite to Pasir Salak, said, `What the Maharaja Lela does I will do.' The Sultan then got up and withdrew. Read it all here..........................................the soldiers who died bringing these slavers to justice.